The 1990 Tour de France was the 77th edition of the Tour de France, taking place between 30 June and 22 July. The total race distance was 21 stages over 3,504 km (2,177 mi). American Greg LeMond repeated his 1989 victory in the overall competition, becoming a three-time winner despite not winning an individual stage, something which has happened only twice since, in the 2006 and 2017 Tour de France. The surprise of the Tour was Claudio Chiappucci, who won ten minutes in the first stage, and was still leading the race two days before the end. The points classification was won by Olaf Ludwig, while the mountains classification was won by Thierry Claveyrolat. For a more comprehensive list, see List of teams and cyclists in the 1990 Tour de France. The 1990 Tour started with 198 cyclists, divided into 22 teams of 9 cyclists: Sixteen teams qualified based on the FICP team ranking, while six teams were given wildcards. The Alfa Lum team was made out of Soviet cyclists. The winner of the previous year, Greg LeMond, had for the first time in his career the full support of his team mates Z–Tomasso, however he did not have a great pre-season, being overweight and suffering from mononucleosis. LeMond had won the 1989 UCI Road World Championships, but had not won any race since. The organising newspaper L'Équipe was expecting a close battle between LeMond and Laurent Fignon, who had finished in second place in 1989, only eight seconds behind LeMond. Pedro Delgado, the winner of 1988, was part of the strong Banesto team, with Miguel Indurain to help him in the mountains. The fourth favourite was Erik Breukink. The 1990 Tour de France started on 30 June, and had two rest days. On the first rest day, the cyclists were transferred from Rouen to Strasbourg, on the second rest day the cyclists were in Villard-de-Lans. 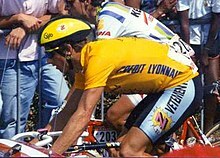 In the prologue, LeMond showed that he was in good shape by finishing second, behind specialist Thierry Marie. The first and the second stage were run on the same day, the second stage in the team time trial format. Most cyclists wanted to save energy in the first stage, and Steve Bauer saw this as an opportunity to escape and win enough time to lead the general classification, as he had done in 1988. Similarly, Claudio Chiappucci, who had won the mountains classification in the Giro d'Italia earlier that year, saw it as an opportunity to gain points for the mountains classification, so he could wear the polka-dot jersey as leader for this classification for a few stages, and enjoy the accompanied publicity. Chiappucci and Bauer escaped early in the stage, and were joined by Ronan Pensec and Frans Maassen. The rest of the peloton allowed them to stay away, so the group finished more than ten minutes ahead of the other cyclists. These four were not considered real favourites for the overall victory, although Bauer and Pensec had already finished in the top ten of the Tour before. Maassen won the stage, and Bauer became the leader of the general classification. In the next few stages, the four men in the breakaway remained on top of the general classification. In the fourth stage, Robert Millar crashed, and lost nine minutes, putting him out of contention for the overall victory. The time trial of stage 7 was won by Raul Alcala, with Miguel Indurain in second place. The four men from the breakaway all finished in the top 25, and were still minutes ahead of the rest in the general classification. In stage ten in the Alps, Thierry Claveyrolat escaped to win points for the mountains classification, and stayed away to the finish, to win the stage. Behind him, Pensec and Chiappucci finished together with the big names, while Bauer and Maassen lost some time. Pensec became the new leader of the general classification. The eleventh stage was also in the Alps, and the big favourites showed themselves. Bugno won the stage before LeMond and Breukink, but Pensec was only 48 seconds behind, and Chiappucci 86 seconds. Bauer and Maassen lost more than 20 minutes, so after this stage Pensec was leading the general classification, almost one and a half minute before Chiappucci, with LeMond in third place, still more than nine minutes behind. This was followed by an individual time trial in stage twelve. Pensec could not set a good time, but Chiappucci finished in eighth place, and became the new leader. The winner of the time trial, Breukink, jumped to third place, seven minutes behind Chiappucci, with LeMond now in fourth place, at seven and a half minutes. In the thirteenth stage, Pensec escaped early in the stage, forcing Chiappucci's team to chase him. When they had finally caught him, LeMond attacked, with Breukink and Delgado following him. Chiappucci's team mates could not help him anymore, Chiappucci was not helped by other teams, and lost almost five minutes. He was still leading the general classification, but now only with a margin of two minutes on Breukink. Chiappucci understood that he had a chance to win the Tour, but that he would have to show something special. In the sixteenth stage, he escaped, hoping to win time on LeMond and Breukink. Breukink had a bad day, and lost considerable time, but LeMond was able to get back to Chiappucci just before the final climb. At that climb, LeMond left Chiappucci behind. The stage was won by Indurain with LeMond in second place. In the general classification, Chiappucci kept a slim lead of five seconds on LeMond, but a time trial still due, which was LeMond's specialty. In the seventeenth stage, LeMond punctured. Chiappucci and his team mates then increased their speeds (breaking the unwritten rules of not attacking when others have mechanical failures). Some of LeMond's team mates were in a break-away, and they were ordered to wait for LeMond so they could help him. They were not allowed to turn around and ride towards LeMond, so they had to wait for seven minutes until LeMond was with them. The worked together and were able to get LeMond back to Chiappucci, but LeMond was angry at Chiappucci's tactics. The stage was won by Dimitri Konyshev, the first Soviet rider to win a Tour de France stage. In the last time trial in stage twenty, Breukink won, and as expected LeMond gained enough time on Chiappucci to win the Tour. There were several classifications in the 1990 Tour de France. The most important was the general classification, calculated by adding each cyclist's finishing times on each stage. The cyclist with the least accumulated time was the race leader, identified by the yellow jersey; the winner of this classification is considered the winner of the Tour. The points classification was calculated in another way: the first cyclists to finish in a stage received points, based on their rank and the type of stage. All stages (except time trials) also had one or more intermediate sprints, where some points could be won. The cyclist with the most points lead the classification, and was identified with a green jersey. Additionally, there was the mountains classification. The organisation had categorized some climbs into categories; points for this classification were won by the first cyclists that reached the top of these climbs first. The cyclist with the most points lead the classification, and was identified with a polkadot jersey. There was also the young rider classification. This was decided the same way as the general classification, but only riders born after 1 January 1966 were eligible. The 1989 Tour de France included the Combination classification and the Intermediate sprints classification. The 1990 Tour, however, did not feature these classifications. For the combativity classification, a jury gave points after each stage to the cyclists they considered most combative. The cyclist with the most votes in all stages lead the classification. Greg LeMond (USA) Z–Tomasso 90h 43' 20"
Claudio Chiappucci (ITA) Carrera Jeans–Vagabond + 2' 16"
Erik Breukink (NED) PDM–Concorde + 2' 29"
Pedro Delgado (ESP) Banesto + 5' 01"
Marino Lejarreta (ESP) ONCE + 5' 05"
Eduardo Chozas (ESP) ONCE + 9' 14"
Gianni Bugno (ITA) Chateau d'Ax–Salotti + 9' 39"
Raúl Alcalá (MEX) PDM–Concorde + 11' 14"
Claude Criquielion (BEL) Lotto–Superclub + 12' 04"
Miguel Indurain (ESP) Banesto + 12' 47"
Andrew Hampsten (USA) 7-Eleven + 12' 54"
Pello Ruiz (ESP) ONCE + 13' 39"
Fabio Parra (COL) Kelme–Ibexpress + 14' 35"
Fabrice Philipot (FRA) Castorama + 15' 49"
Gilles Delion (FRA) Helvetia–La Suisse + 16' 57"
William Palacio (COL) Postobón–Manzana–Ryalcao + 19' 43"
Johan Bruyneel (BEL) Lotto–Superclub + 20' 24"
Roberto Conti (ITA) Ariostea + 20' 43"
Eric Boyer (FRA) Z–Tomasso + 22' 09"
Ronan Pensec (FRA) Z–Tomasso + 22' 54"
Thierry Claveyrolat (FRA) RMO + 23' 33"
Jérôme Simon (FRA) Z–Tomasso + 27' 23"
Pascal Lino (FRA) RMO + 30' 38"
Anselmo Fuerte (ESP) ONCE + 31' 18"
Dmitri Konychev (URS) Alfa Lum + 31' 21"
Atle Kvålsvoll (NOR) Z–Tomasso + 32' 03"
Steve Bauer (CAN) 7-Eleven + 34' 05"
Abelardo Rondon (COL) Banesto + 35' 37"
Miguel Angel Martinez (ESP) ONCE + 38' 39"
Sean Kelly (IRE) PDM–Concorde + 38' 42"
Jörg Müller (SUI) TVM + 39' 50"
Nelson Rodriguez (COL) Kelme–Ibexpress + 39' 56"
Steven Rooks (NED) Panasonic–Sportlife + 42' 09"
Stephen Hodge (AUS) ONCE + 44' 22"
Pascal Simon (FRA) Castorama + 45' 47"
Patrick Robeet (BEL) Weinmann–SMM–Uster + 46' 59"
Reynel Montoya (COL) Postobón–Manzana–Ryalcao + 50' 16"
Oscar Vargas (COL) Postobón–Manzana–Ryalcao + 52' 11"
Bruno Cornillet (FRA) Z–Tomasso + 53' 00"
Gerardo Moncada (COL) Postobón–Manzana–Ryalcao + 53' 36"
Jesús Rodríguez (ESP) Banesto + 53' 44"
Beat Breu (SUI) Weinmann–SMM–Uster + 59' 13"
Rudy Dhaenens (BEL) PDM–Concorde + 59' 51"
Stephen Roche (IRE) Histor–Sigma + 1h 00' 07"
Piotr Ugrumov (URS) Alfa Lum + 1h 01' 42"
Omar Pablo Hernandez (COL) Postobón–Manzana–Ryalcao + 1h 02' 46"
Philippe Louviot (FRA) Toshiba–Look + 1h 03' 18"
Alvaro Mejia (COL) Postobón–Manzana–Ryalcao + 1h 05' 04"
Charly Mottet (FRA) RMO + 1h 06' 57"
Jean-Claude Colotti (FRA) RMO + 1h 08' 31"
Pascal Lance (FRA) Toshiba–Look + 1h 09' 37"
Jean-Claude Bagot (FRA) RMO + 1h 10' 21"
Carlos Jaramillo (COL) Postobón–Manzana–Ryalcao + 1h 10' 47"
Guy Nulens (BEL) Panasonic–Sportlife + 1h 10' 53"
Viatcheslav Ekimov (URS) Panasonic–Sportlife + 1h 14' 32"
Dag Otto Lauritzen (NOR) 7-Eleven + 1h 15' 25"
Toni Rominger (SUI) Chateau d'Ax–Salotti + 1h 15' 51"
Michel Dernies (BEL) Weinmann–SMM–Uster + 1h 17' 44"
Dominique Arnaud (FRA) Banesto + 1h 18' 28"
Brian Holm (DEN) Histor–Sigma + 1h 20' 54"
Mauro Gianetti (SUI) Helvetia–La Suisse + 1h 21' 06"
Marc Sergeant (BEL) Panasonic–Sportlife + 1h 21' 26"
Vicente-Juan Ridaura (ESP) Seur + 1h 21' 38"
Frans Maassen (NED) Buckler–Colnago–Decca + 1h 22' 14"
Gilbert Duclos-Lassalle (FRA) Z–Tomasso + 1h 22' 34"
Maarten Ducrot (NED) TVM + 1h 23' 38"
Gerrit de Vries (NED) Buckler–Colnago–Decca + 1h 23' 54"
Jos Haex (BEL) Lotto–Superclub + 1h 25' 04"
Alessandro Giannelli (ITA) Carrera Jeans–Vagabond + 1h 25' 12"
William Pulido (COL) Postobón–Manzana–Ryalcao + 1h 29' 36"
Phil Anderson (AUS) TVM + 1h 30' 01"
Alberto Elli (ITA) Ariostea + 1h 30' 40"
Luc Leblanc (FRA) Castorama + 1h 31' 13"
Alberto Volpi (ITA) Chateau d'Ax–Salotti + 1h 31' 19"
Marcello Siboni (ITA) Ariostea + 1h 33' 12"
Roberto Gusmeroli (ITA) Chateau d'Ax–Salotti + 1h 33' 16"
Denis Roux (FRA) Toshiba–Look + 1h 33' 30"
Melchor Mauri (ESP) ONCE + 1h 33' 40"
Juan Carlos Castillo (COL) Postobón–Manzana–Ryalcao + 1h 34' 19"
Davide Cassani (ITA) Ariostea + 1h 34' 21"
Johan Museeuw (BEL) Lotto–Superclub + 1h 35' 10"
Laurent Biondi (FRA) Histor–Sigma + 1h 35' 49"
Ron Kiefel (USA) 7-Eleven + 1h 39' 11"
Roland Le Clerc (FRA) Toshiba–Look + 1h 39' 28"
Søren Lilholt (DEN) Histor–Sigma + 1h 40' 11"
Nestor Oswaldo Mora (COL) Kelme–Ibexpress + 1h 40' 50"
Uwe Raab (GER) PDM–Concorde + 1h 41' 05"
Mario Kummer (GER) Chateau d'Ax–Salotti + 1h 42' 38"
José Urea (ESP) Seur + 1h 42' 53"
Herminio Diaz (ESP) ONCE + 1h 43' 18"
Frédéric Brun (FRA) RMO + 1h 43' 52"
José-Luis Rodriguez (ESP) Seur + 1h 44' 16"
Peter Roes (BEL) Lotto–Superclub + 1h 45' 22"
Kurt Steinmann (SUI) Weinmann–SMM–Uster + 1h 45' 44"
Massimo Ghirotto (ITA) Carrera Jeans–Vagabond + 1h 46' 57"
Marino Alonso (ESP) Banesto + 1h 47' 19"
Willem Van Eynde (BEL) Lotto–Superclub + 1h 47' 48"
Juan Martinéz (ESP) Banesto + 1h 48' 34"
Giancarlo Perini (ITA) Carrera Jeans–Vagabond + 1h 49' 17"
Eric Van Lancker (BEL) Panasonic–Sportlife + 1h 50' 11"
Edwig Van Hooydonck (BEL) Buckler–Colnago–Decca + 1h 53' 05"
Bruno Cenghialta (ITA) Ariostea + 1h 53' 46"
Laurent Pillon (FRA) Histor–Sigma + 1h 53' 58"
François Lemarchand (FRA) Z–Tomasso + 1h 54' 12"
Jan Schur (GER) Chateau d'Ax–Salotti + 1h 54' 13"
Paul Haghedooren (BEL) Histor–Sigma + 1h 54' 29"
Thierry Laurent (FRA) RMO + 1h 55' 43"
Acácio da Silva (POR) Carrera Jeans–Vagabond + 1h 56' 25"
Valerio Piva (ITA) Ariostea + 1h 57' 31"
Carlo Bomans (BEL) Weinmann–SMM–Uster + 1h 58' 24"
Adrie van der Poel (NED) Weinmann–SMM–Uster + 1h 58' 31"
Thomas Wegmüller (SUI) Weinmann–SMM–Uster + 1h 59' 03"
Henri Manders (NED) Helvetia–La Suisse + 1h 59' 15"
Jan Goessens (BEL) Weinmann–SMM–Uster + 2h 01' 19"
Twan Poels (NED) Buckler–Colnago–Decca + 2h 02' 28"
Andy Bishop (USA) 7-Eleven + 2h 03' 10"
Gerrit Solleveld (NED) Buckler–Colnago–Decca + 2h 04' 50"
Giuseppe Calcaterra (ITA) Chateau d'Ax–Salotti + 2h 04' 51"
Sean Yates (GBR) 7-Eleven + 2h 05' 43"
Wilfried Peeters (BEL) Histor–Sigma + 2h 05' 43"
Thierry Marie (FRA) Castorama + 2h 06' 58"
Guido Bontempi (ITA) Carrera Jeans–Vagabond + 2h 08' 05"
Patrick Tolhoek (NED) Buckler–Colnago–Decca + 2h 08' 10"
Pablo Moreno (ESP) Seur + 2h 08' 58"
Jos van Aert (NED) PDM–Concorde + 2h 09' 31"
Alexandre Trubine (URS) Alfa Lum + 2h 11' 01"
Jelle Nijdam (NED) Buckler–Colnago–Decca + 2h 11' 12"
Martin Schalkers (NED) TVM + 2h 12' 32"
Patrick Verschueren (BEL) Lotto–Superclub + 2h 13' 06"
Erich Mächler (SUI) Carrera Jeans–Vagabond + 2h 13' 58"
Mauro-Antonio Santaromita (ITA) Chateau d'Ax–Salotti + 2h 14' 45"
Bob Roll (USA) 7-Eleven + 2h 14' 50"
Vincent Barteau (FRA) Castorama + 2h 17' 41"
Adriano Baffi (ITA) Ariostea + 2h 18' 39"
Jose-Angel Sarrapio (ESP) Kelme–Ibexpress + 2h 20' 22"
Andreas Kappes (GER) Toshiba–Look + 2h 20' 55"
Peter De Clercq (BEL) Lotto–Superclub + 2h 21' 26"
Antonio Miguel Diaz (ESP) Kelme–Ibexpress + 2h 22' 37"
Jean-Claude Leclercq (FRA) Helvetia–La Suisse + 2h 23' 36"
Gert Jakobs (NED) PDM–Concorde + 2h 24' 04"
Olaf Ludwig (GER) Panasonic–Sportlife + 2h 26' 33"
Norman Alvis (USA) 7-Eleven + 2h 26' 41"
Jan Siemons (NED) TVM + 2h 27' 30"
Michel Vermote (BEL) RMO + 2h 32' 12"
Djamolidine Abduzhaparov (UZB) Alfa Lum + 2h 32' 48"
Jean-Paul van Poppel (NED) Panasonic–Sportlife + 2h 34' 55"
Giovanni Fidanza (ITA) Chateau d'Ax–Salotti + 2h 35' 11"
Vassili Jdanov (UKR) Alfa Lum + 2h 42' 53"
Christian Chaubet (FRA) Toshiba–Look + 2h 43' 40"
Hendrik Redant (BEL) Lotto–Superclub + 2h 47' 53"
Nikolai Golovatenko (URS) Alfa Lum + 2h 49' 08"
Jesús Rosado (ESP) Kelme–Ibexpress + 2h 56' 11"
Davis Phinney (USA) 7-Eleven + 2h 59' 29"
Maximilian Sciandri (GBR) Carrera Jeans–Vagabond + 3h 00' 11"
Antonio Espejo (ESP) Kelme–Ibexpress + 3h 13' 27"
Rodolfo Massi (ITA) Ariostea + 3h 16' 26"
Gilles Delion (FRA) Helvetia–La Suisse 91h 00' 17"
Pascal Lino (FRA) RMO + 13' 41"
Dmitri Konychev (URS) Alfa Lum + 14' 14"
Miguel Angel Martinez (ESP) ONCE + 21' 42"
Alvaro Mejia (COL) Postobón–Manzana–Ryalcao + 48' 07"
Viatcheslav Ekimov (URS) Panasonic–Sportlife + 57' 35"
Gerrit de Vries (NED) Buckler–Colnago–Decca + 1h 06' 57"
Luc Leblanc (FRA) Castorama + 1h 14' 16"
Roberto Gusmeroli (ITA) Chateau d'Ax–Salotti + 1h 16' 10"
Melchor Mauri (ESP) ONCE + 1h 16' 43"
Postobón–Manzana–Ryalcao + 1h 09' 36"
Lotto–Superclub + 1h 15' 09"
Castorama + 1h 43' 47"
7-Eleven + 1h 48' 31"
Helvetia–La Suisse + 2h 02' 30"
^ a b c "77ème Tour de France 1990" (in French). Mémoire du cyclisme. Archived from the original on 13 August 2012. Retrieved 26 September 2016. ^ "Trois équipes" (in French). Le soir. 18 May 1990. Retrieved 24 April 2013. ^ a b c d e f g h i j k l McGann, Bill; McGann, Carol (2008). The story of the Tour de France: 1965-2007. Dog Ear Publishing. pp. 191–197. ISBN 1-59858-608-4. Retrieved 30 March 2013. ^ a b c d e f g Birnie, Lionel. "Classic races: 1990 Tour de France". Cyclesport. IPC Media. Retrieved 1 April 2013. ^ a b Augendre 2016, p. 81. ^ "TOUR DE FRANCE : LeMond Has Flat as Konyshev Wins 17th Stage". Los Angeles Times. 18 July 1990. ^ "Tour de France 1990 – Leaders overview". ProCyclingStats. Archived from the original on 16 February 2019. Retrieved 16 February 2019. ^ van den Akker, Pieter. "Informatie over de Tour de France van 1990" [Information about the Tour de France from 1990]. TourDeFranceStatistieken.nl (in Dutch). Archived from the original on 2 March 2019. Retrieved 2 March 2019. ^ a b c d e McGann, Bill. 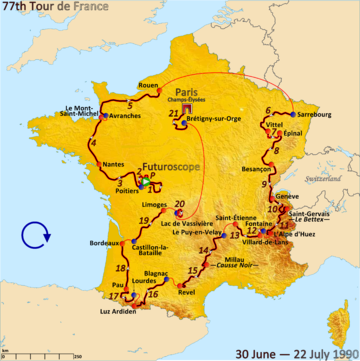 "1990 Tour de France". Bike race info. Retrieved 11 April 2012. This page was last edited on 15 April 2019, at 04:41 (UTC).